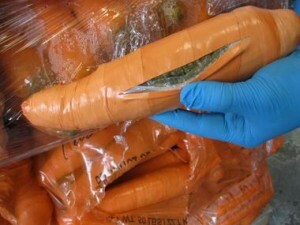 Fake carrots stuffed with marijuana, via CBP. Border Patrol agents found 2,500 pounds of marijuana stuffed inside fake carrots that were being hauled across the Mexico border in Texas, Cleveland.com reports. A drug-sniffing dog detected marijuana in a tractor-trailer that was crossing the Pharr-Reynosa International Bridge. Border Patrol agents found the fake carrots that were mixed with real carrots. The estimated value of the pot was $499,000, Customs and Border Protections said.